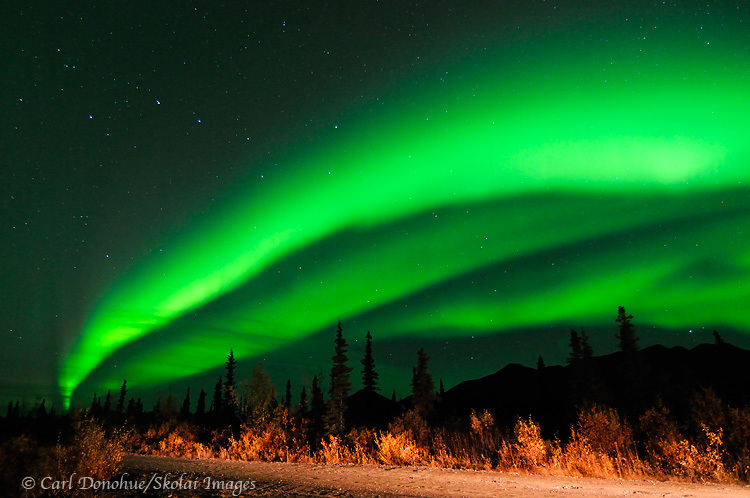 Aurora borealis photo | Northern lights, Wrangell - St. Elias National Park, Alaska. Aurora borealis photo. Using my vehicle headlights to light up the foreground a little bit. Northern lights, Wrangell – St. Elias National Park and Preserve, Alaska. Please click on the image above to view a larger version of the photo. An aurora borealis photo taken a few weeks ago. I’ve never had the good fortune to shoot the aurora borealis on a well lit night; a clear night when the moon is full, or close to it, would be ideal. My luck always seem to run into a dark night, which makes for a great, great experience, but the photographs could benefit from some ambient light on the foreground. So, in this particular instance, I turned on the lights of my van for a split second during the exposure. It took me a couple of tries to get the balance right, and it’s far from ideal, but I kind of like this shot; taken along the Nabesna Road in mid-September. It’s kinda eery, driving down the road at night and having the aurora borealis start up like this. It generates a little angst, as I suddenly have to figure out where I’ll go to photograph it. Having a good knowledge of the place I’m in makes a huge difference. I’m pretty familiar with the Nabesna Road’ it’s the northern entrance to Wrangell – St. Elias National Park and Preserve, and I’ve travelled each mile of it many times. Knowing the terrain, etc, helped me quickly decide where I’d go setup to shoot. Of course, not knowing much about the aurora borealis and what it was going to do counters that little advantage pretty easily. For example, one night I saw the aurora start up, and I headed to a nearby pond, hoping for some reflections; no wind, perfect, I thought. However, the aurora quickly subsided and faded, and my well laid plans went awry. I headed off into the night, set up camp, and got ready for bed. The aurora borealis decided it wasn’t yet done, and came back brighter, stronger and more vibrant than ever. I shot for an hour or 2, and made some nice images, but I SOOOO wish I’d stayed put. Sometimes I just can’t win for losing. The spontaneity of the landscape is perhaps its greatest gift to us. As photographers, we can only ever try to catch a sliver of that, a reminder to us all to not let go of the moment. Ever. This entry was posted in Adventures, Alaska, Northern Lights, Photo Tours, Photography, Winter, Wrangell - St. Elias National Park and tagged aurora borealis, Landscapes, Northern Lights, scenics, Wrangell - St. Elias National Park on October 15, 2010 by Carl D.